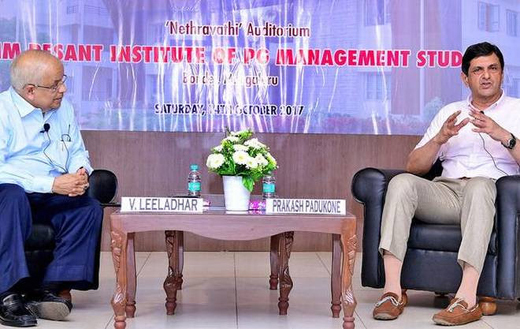 Udupi, Oct 16, 2017: Speaking at a programme organised by Manel Srinivas Nayak Memorial Besant Institute of Postgraduate Management Studies in the city. Former reputed badminton player Prakash Padukone said shuttle badminton was an unknown play in India during the ‘60s-‘70s whereas ball badminton was a popular. He said he took up badminton under the influence of his father and continued to play owing to sheer passion for the sport. Padukone informed his training centre was a marriage hall where weddings were conducted during one half of the year, while he used to undergo training during the remaining period. There was neither a coach nor books for guidance nor was there technology to support training, he said. Padukone said he did not have any tall ambition to become a champion, but his passion grew after becoming national level senior champion at the age of 16. He then nursed the ambition of becoming the All England Champion, the then highest position a badminton player could reach. He began training extensively thereafter and won the All England Championship, after which badminton got a place in India too. Padukone said sports is getting much patronage in the country these days next only to cricket. Saina Nehwal and P.V. Sindhu are playing well and there is every possibility of more champions emerging in the future. Bright sportspersons have a place in his badminton academy too where rigorous training is offered even as sponsors are available. Sportspersons are trained to compete in the Olympics at the academy, he said. Former Deputy Governor of Reserve Bank of India V. Leeladhar coordinated the dialogue.